Cait's Cozy Corner : Five On Friday! HALLELUJAH friends! We made it to freakin' Friday! As my first week as a SAHM it was a challenge to say the least but I'm sooo excited to enjoy the weekend with not many plans with the family! The week actually wasn't as crazy as I thought since I had a few fun things with friends planned, schools looked at for Lily and Landon and getting acclimated to being in my hometown. I wanted to share a few Friday Favorites with you all on the blog so grab a cup of coffee and let's get going! 1. Sea Salt Caramels - I blame my Dad for getting these at Costco and I'm even terrified to admit how many of these bad boys I've consumed the last few days I've been here. They are ridiculously good and I can't get enough. Do I need an intervention?! Umm.... maybe? THESE are also really good! 2. 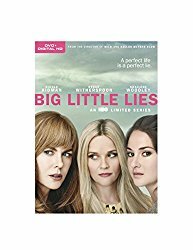 BIG LITTLE LIE - Thanks to my amazing SIL who let me watch some awesome shows on her Amazon account, I can finally start watching Big Little Lies that so many of you have been telling me to get on! I actually read a bit of the book a few months back but forgot so much of it so I'm just anxious to get to bed and watch an episode each night! When is Season 2 coming out?! 3. 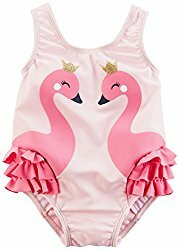 Swimsuits - My mom ran to Carter's the other day and found Lily some of the most adorable swim suits for this summer. I swear I wish I made them in my size! This one shoulder is soooo stinkin' cute but I love this flamingo one too! Now I just need to get some swim lessons on the calendar! 4. 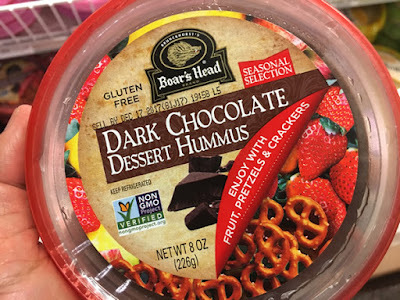 Dessert Humus - I kid you not, I tried this at the grocery store the other day and almost stopped myself because I thought there is no way this even good. WRONG O. It's the best and sadly they were actually out of this one that I wanted. Amazon to the rescue to get more! Share something you are excited to do this weekend! That little flamingo swimsuit is the cutest!